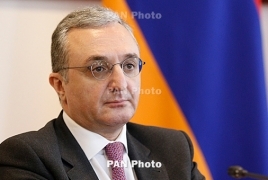 PanARMENIAN.Net - Armenian Foreign Minister Zohrab Mnatsakanyan has briefed Jean-Yves Le Drian, the French Minister for Europe and Foreign Affairs, about the current developments surrounding the Nagorno Karabakh conflict settlement. The Armenian minister on Tuesday, April 16 revealed details from his recent meeting with Azerbaijani and Russian Foreign Ministers in Moscow. Le Drian, in turn, reaffirmed France’s determination, in its capacity as co-chair of the Minsk Group, to remain committed to finding a negotiated settlement to the conflict. At the meeting in Paris, the Armenian diplomat said his visit to the French capital is "very emotional" after the devastating fire in the Notre-Dame Cathedral. Also Mnatsakanyan said Armenia appreciates France's move to old a national day on April 24 to commemorate the Armenian Genocide. The two Ministers discussed relations between Armenia and France, at the same time prioritizing the development of ties between the European Union and Armenia. Mnatsakanyan stressed the launch of visa liberalization dialogue as a way to promote contacts between Armenia and the EU.